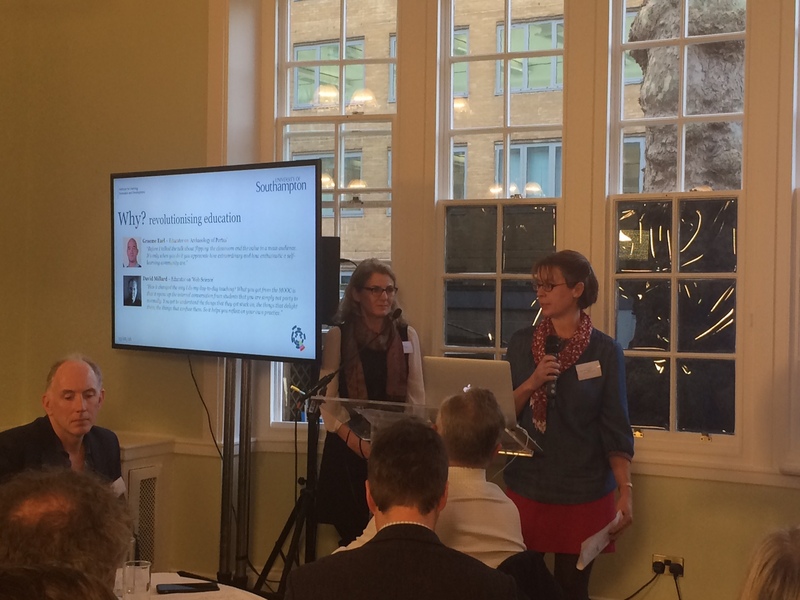 Kate and I were very pleased to present a summary of Southampton’s progress with MOOCs and their impact within the classroom to FutureLearn’s Partner Advisory Group Event yesterday. It was an honour (and a challenge!) to follow on from such inspirational and energetic speakers as Peter Horrocks, VC of the Open University, Simon Nelson the CEO of Futurelearn, Helena Gillespie Director of Teaching and Learning at UEA, and many others. The key message from the day was that the web is already transforming all aspects of our lives and education is no exception. Forward thinking universities need to stop treating digital simply as online file storage and instead focus on harnessing its potential for social, collaborative learning on a global basis. Now the world’s 3rd largest MOOC provider, and recent winner of Best User Experience in the UXUK Awards, Futurelearn is well placed to drive this change. There are many exciting developments lined up for 2016 so watch this space! Student Digital Champions Tim O’Riordan and Hannah Watts were the brains behind what was probably the first video broadcast using Periscope to support an online course in the UK – a real time discussion between the FutureLearn Digital Marketing MOOC educators Lisa Harris and Chris Phethean. The MOOC asks learners to try out new social tools and think about how they may (or may not) work in a learning or a business context. So to demonstrate what this involves, we decided to give this relatively new social video broadcasting app a try – and naturally called in the Digichamps to lend an expert hand. Periscope allows you to watch live videos from your mobile device and interact with the presenters in real time, either directly within the app or via Twitter. We’d had a go with the app a few times over the summer and found that it worked well in connecting with a reasonably large audience. We’d also seen Inger Mewburn on the EdX Surviving your PhD MOOC, and the BBC Outside Source broadcasts, and decided we were ready to take the plunge into a more planned approach to this new form of social broadcasting. Online learning is often criticised as being a lonely activity, with limited opportunity for interaction with tutors and other learners. Asynchronous discussions within the learning platform can address this issue to some extent, but timely replies are not always forthcoming and learners’ attention moves on to the next section. We have used Google Hangouts successfully in previous runnings of our MOOCs – but these can be cumbersome to set up and while real time discussion between a small group of invited participants works really well, (Google’s limit is 10 participant windows) there is limited opportunity for the wider audience to interact with the presenters or each other. We felt that the Digital Marketing MOOC was an ideal place to trial a Periscope discussion because potentially there is a double benefit to learners in this MOOC – marketing communications themselves are rapidly evolving as the technologies which allow video and time/location-specific applications converge. So we asked the learners to consider the value of the experiment as both a learning activity to them personally, and also as an example of how marketers might apply the same principles. Early adopters of Periscope for marketing purposes are using it for “behind the scenes” coverage of key events, Q&A sessions for staff with senior management, demonstrations of new product development, addressing specific customer service issues etc. Using Periscope is very straightforward; you just download the app to your mobile device, sign into Twitter, log in to Periscope and then start broadcasting. The interface design is uncluttered and we found our way around the controls and settings very well without any assistance. However if you need a helping hand, the app’s ‘Help Center’ provides unambiguous and well laid out guidance. In addition Periscopes’ web page contains privacy and terms of service information that are written in clear English – and are well worth a read. Periscoping is very easy for ad hoc social interaction, but if you have an expectant audience and a message to deliver, you can’t leave much to chance. 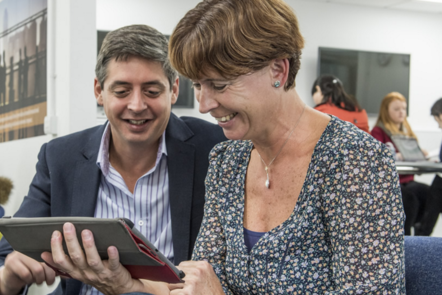 The plan was for Lisa and Chris to discuss questions from the MOOC and the live Twitter feed at a prearranged time (15:00 GMT, 5 November 2015). We’d had network problems with previous attempts, so we had an additional camera on stand-by to ensure we had something for our audience to watch if the broadcast failed. With a crew of two (myself supervising the broadcast, and Hannah noting comments as they appeared – and passing on questions) we used an iPhone 5s as the broadcast camera set up in horizontal mode (Periscope broadcast in vertical video, but correct this on playback). In order to let our audience know where to find the broadcast (and with the iPhone pointing at a ‘holding screen’), we hit the ‘start broadcasting’ button 15 minutes before the discussion was due to begin. This automatically created a tweet on the Digital Marketing MOOC twitter account containing a link to the broadcast – which we copied and posted directly into the relevant section of the MOOC. About 30 seconds before the start of the discussion I started recording on the standby camera, and used Quicktime to screen record the Periscope browser window. At 3pm the holding screen was removed from in front of the camera to reveal Lisa and Chris ready to start. Within seconds sound was turned on and the discussion could begin. 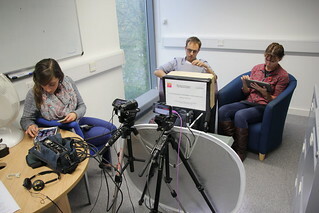 During the broadcast Lisa and Chris discussed comments from the previous week on the MOOC and were also able to answer questions posted on Twitter during the broadcast. Altogether we had over 90 viewers watching and a high number of interactions during transmission – plus some very positive feedback and sharing of relevant resources in the MOOC discussion board. While Periscope’s terms of service prohibit broadcasting content you don’t own, there are concerns over the ease with which it could encourage copyright infringement as well as invasion of privacy. After all, anyone with the app can publically broadcast and share the precise location of anything or anyone they point their camera and microphone at. This may not be a big problem for everyday social users, but institutional users need to be aware of the potential for unknowing infringement. When you use Periscope, you retain the rights to the content you produce, but you also licence Periscope and associated companies (including its parent, Twitter) to re-use your content in order to make it available to a worldwide audience. While your content may be held on any of the servers owned by Twitter anywhere in the world, your licence agreement is with Twitter’s European company, which is based in Ireland. It’s also worth noting that while your broadcast is public by default, you can limit your audience to your followers on Periscope – and you can block other Periscope users. The purpose of the app is to provide a quick and easy way to broadcast video and audio to anyone in the world, and in order to do this some compromises need to be made. So, while your device may be capable of recording in HD, Periscope does not broadcast or record in HD, rather it uses the much lower 360p resolution. Even with this low resolution, if you’re not on WiFi, your device will use a large amount of data during a broadcast – we recorded around 3MB per minute during a recent session. Also, as others have noted – Periscope drains your battery. Previously we had used up 80% of our phone’s full charge in just over an hours broadcasting of a number of short sessions. The video may be low res., but we make sure the sound is a good as we can get it. Audio uses up less bandwidth than video, and makes a huge difference to learner’s engagement and we use a separate, powered microphone plugged directly into our device using an iRig pre amplifier. Away from our unlimited wifi – usually off campus – we keep broadcasts short to minimise network use. We connect to power (via a 3m long USB lead) to ensure that our device keeps going throughout our broadcasts. You may wonder why we went to such great lengths to record the broadcast. Firstly, Periscope broadcasts only stay online for 24 hours, so we needed a copy to put on YouTube for those who missed it. Also, while the iPhone records the video, the quality is quite poor – and it doesn’t record the questions, comments and other feedback that are visible in the Periscope broadcast. So we needed to record the browser window off screen at high resolution (MacBook Pro with Retina screen) to ensure we had a copy that could be used later in the course – or possibly to support later iterations. Finally, apologies for the jerkiness of the video – although we were on a very high speed network, this seems to be how Periscope currently works. I really enjoyed the Periscope experiment we carried out as part of the Digital Marketing MOOC. I was responsible for monitoring the real-time audience interaction taking place within the Periscope app and on Twitter via the hashtag #FLdigital. I answered general questions and queries viewers had about the broadcast and notified the presenters of topical questions raised by the audience to be answered live. My pre-broadcast responsibilities involved preparing tweets to invite and encourage audience participation, I saved these in a Google document and copied content to Twitter at the most appropriate times (including post-broadcast). However, next time I would ensure these were saved in drafts on Twitter to create a smoother more efficient way to post and interact with the audience. During the broadcast I used my smartphone to monitor the Periscope activity and respond to comments made within the app. It is important you carefully observe this activity because comments appear on the side of the screen during the broadcast and disappear very quickly, as far as I am aware there is no record of these comments once they are gone. During future broadcasts I would screenshot activity I thought was particularly interesting. I also used my iPad to monitor Twitter activity and a trusty notepad to list questions to be passed to the presenters. I monitored the sound of the broadcast via my smartphone but I experienced a slight hiccup at the beginning of the broadcast because my headphones were not plugged in and therefore, the sound created an echo on the live-stream recording. Other than that, I felt the broadcast ran very smoothly. I think the decision to start the broadcast 15 minutes early to allow the audience to prepare was very wise and worked well for us because we were able to circulate the broadcast URL across various platforms, including the MOOC and social media. This was my first experience using Periscope, other than watching one broadcast when I first downloaded the app. I’ve participated in Google Hangouts before, and I was actually quite surprised by how much I preferred Periscope for this kind of broadcast. On Hangouts, I tend to feel like you can ‘lose’ your audience a bit, and it all turns into a bit of a videoconference between the participants, rather than a broadcast to the viewers. With Periscope, and perhaps because you are limited by how many people can realistically be involved, it feels much more focused on providing something short and snappy to the viewers, and having the chance to respond to some live feedback. The process of setting up also seemed much more straightforward, and you don’t need to worry about finding out that one of your participants doesn’t have a Google account two minutes before the broadcast is due to start! This takes away some of the pressure on the participants, letting them focus more on the content rather than the technical setup. Originally published on the Digital Marketing MOOC blog with Tim O’Riordan, Hannah Watts and Chris Phethean. I’m on my way to Kuala Lumpur to talk about MOOCs and Curriculum Innovation at an event organised by Microsoft and the British Council. UPDATE 13th May – Storifys of tweets from the #ASEANDeepLearning event have now been added below the slides. A snapshot of tweets from day 2 of the British Council / Microsoft #ASEANdeeplearning event in Kuala Lumpur, May 2015.